Click here to order a poster or pre-order a DVD from our store. With unprecedented access and research, NAE PASARAN reveals for the first time the incredible impact made by Scottish factory workers 40 years ago against one of the most repressive dictatorships of the 20th century. 40 years after their defiant stand in protest against Pinochet's Air Force in Chile, Scottish pensioners discover the dramatic consequences of their solidarity. 1974, Scotland. Bob Fulton, a Rolls-Royce engine inspector, returns to his section, upset and anxious. He's just told his colleagues that a Chilean Air Force jet engine has arrived in the factory for maintenance and he's refusing to let it go through, in protest against the recent military coup of General Pinochet. He's seen the images of people packed into football stadiums and the Chilean Air Force jets bombing Santiago, and now one of the engines from those very same planes is right there, waiting for inspection. If you'd like to receive updates on the project or book your own screening subscribe to our newsletter below. Felipe is an award-winning Belgian/Chilean filmmaker based in Scotland. His father was a Chilean journalist exiled to Belgium. It’s at solidarity events in Brussels that, as a kid, Felipe first heard of the story of the Scottish boycott. Through Debasers Filums, which he founded in Edinburgh in 2010, he’s directed and produced three short films, including Three-Legged Horses, based on his experiences as a rickshaw driver in Edinburgh. The 2012 short fiction film was the first successfully crowdfunded film project in Scotland. The film went on to screen at over 100 international film festivals, on five continents, winning four awards. His first short documentary, Nae Pasaran (2013), was commissioned through the Scottish Documentary Institute’s Bridging the Gap scheme and premiered at EIFF, DOK Leipzig and Tribeca. Felipe is an alumni of the Berlinale Talent Campus, Eurodoc, the Independent Filmmaker Programme and the EIFF Talent Lab. 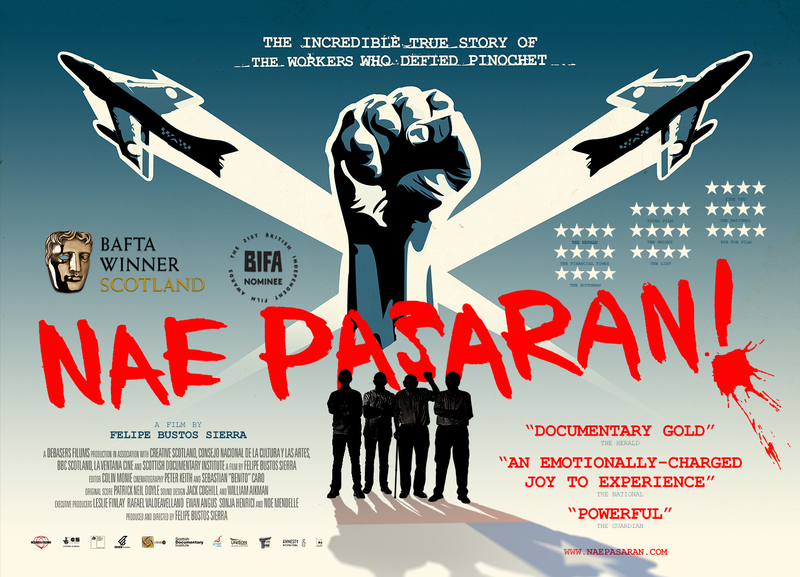 Nae Pasaran (2018), his first feature, was the Closing Gala of the Glasgow Film Festival 2018, premiering to rave reviews. It comes out in the UK in November 2018. Colin started his professional career in the film unit at BBC Scotland. Since going freelance, he has been lucky enough to work on some notable features including Peter Mullan’s Magdalene Sisters which won the Golden Lion at Venice and Discovery at Toronto; Deepa Mehta’s Oscar-nominated Water and David Mackenzie’s Young Adam. His feature documentary work includes Maja Borg’s Future my Love nominated for the Michael Powell Award and the critically acclaimed From Scotland With Love. Colin has been nominated himself for a BIFA for his work on David Mackenzie’s Hallam Foe and for a Genie for Water. Much of his work could be regarded as quite political. He has been working in cutting rooms for thirty years. With over 15 years in the industry, Peter has developed many different techniques working on a wide variety of film sets. His work spans feature films, documentaries, TV dramas, music videos and commercials. He has worked with Werner Herzog, Kevin MacDonald and Dexter Fletcher, amongst many others. He recently became one of the first CAA-certified aerial videographers. Sebastian “Benito” Caro is a Santiago-based Chilean cinematographer with over 10 years of experience in documentary and fiction for television and cinema. He’s currently the in-house DOP for La Ventana Cine. Patrick is a classically trained film and television composer, who has most recently written the score for King Bert Productions’ drama series The Moonstone for BBC One. He has composed the score for feature films such as The Legend of Longwood and Kepler’s Dream, as well as writing additional music and lyrics for international feature films such as Brave (Disney Pixar), Sleuth (Castle Rock Entertainment), La Ligne Droite (Gaumont), and the documentary feature Jig, directed by Sue Bourne. Previous composition for theatre includes William Boyd’s sell out run of Longing at the Hampstead Theatre, and the Edinburgh Fringe 2012 revival of the 1977 musical Glasvegas. Patrick also worked as musical director and music programmer for Kenneth Branagh’s theatre season at the Garrick Theatre in 2016. More recently, Patrick has written the score for theatre productions of An Iliad, Troilus & Cressida and The Trojan Women, as part of the Prague Shakespeare Company’s Trojan War season. Interference Pattern, founded in 2008, is a high-end animation and visual effects studio based in Edinburgh. Our talented core in-house team craft beautiful visual stories for commercials, film, digital, games and print. We have technical expertise and artistic flair in CGI, VFX, visualisation, and 2d animation and motion graphics, bespoke 3d modelling and 360VR and AR. We have produced a variety of high-end projects entirely in-house, or in collaboration with creative partners, with our creations enjoyed by hundreds of millions of people and have helped our clients achieve industry awards. The 1974 boycott of Chilean engines in East Kilbride was only one of many actions taken all over the world in protest against Pinochet's dictatorship. Debasers Filums Ltd. All Rights Reserved.